Fox News' "You Decide" poll today is one of the most blatant examples of the "fair and balanced" network's bias I have yet seen. 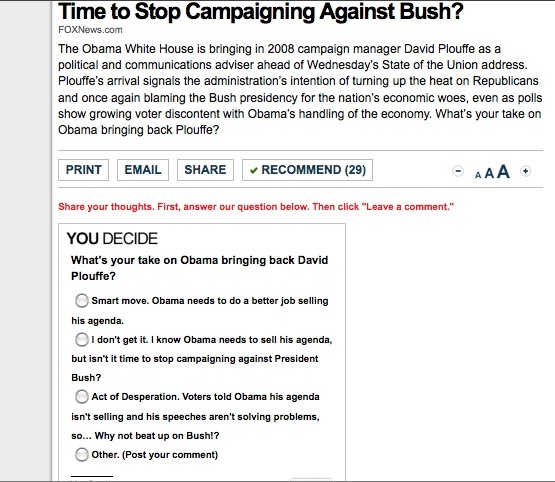 The poll purports to ask, "What's your take on Obama bringing back (2008 campaign manager) David Plouffe?" But starting with the disingenuous headline, "Time to Stop Campaigning Against Bush?" to the all anti-Obama possible answers, except for "Other," Fox News took the news about Plouffe advising the White House, baselessly spun it as a "signal" that the White House will be "once again blaming the Bush presidency for the nation’s economic woes" and turned it into a "poll" in which all the choices, except for "other" are critical of Obama's political strategy. As the screen grab below shows, all of the three answers, except "other" are critical of Obama. Even the one that calls Plouffe's return "a smart move" gratuitously adds, "Obama needs to do a better job selling his agenda." But the next two choices are nothing short of maliciously ridiculous. One says, "I don't get it. I know Obama needs to sell his agenda, but isn't it time to stop campaigning against President Bush?" and the next, "Act of Desperation. Voters told Obama his agenda isn't selling and his speeches aren't solving problems, so… Why not beat up on Bush!?" But there is no indication (and Fox News provided none of its own) that Plouffe or the White House intend to attack Bush. For one thing, Obama just enlisted Bush's help with Haiti aid in the newly-minted Clinton Bush Haiti Fund. Second, Plouffe's own op-ed in yesterday's Washington Post offered no such "signal." Plouffe lists seven strategies to help Democrats "strengthen our hand." The list is proactively Democrat, rather than focusing on blaming Bush. In fact, Bush is only mentioned once, in the fourth one, which is called, "Don't accept any lectures on spending." It says, "The GOP took us from a $236 billion surplus when President Bush took office to a $1.3 trillion deficit, with unpaid-for tax cuts for the wealthy, two wars and the Medicare prescription drug program. Republicans' fiscal irresponsibility has never been matched in our country's history. We have potent talking points on health care, honest budgeting and cuts in previously sacrosanct programs. Republicans will try to win disingenuously by running as outsiders. We must make them own their record of disastrous economic policies, exploding deficits, and a failure to even attempt to solve our health care and energy challenges." Clearly, Plouffe is talking about presenting a positive alternative to the GOP record, rather than merely "blaming" them. Is Fox News too frightened of Plouffe to tell the truth about his agenda? Or are they just so hell-bent on making Obama look bad that they'll use almost any bit of news as an anti-Obama talking point? Or is this just another error for which Fox News supposedly has a "zero tolerance?"